Coding Style, AKA Programming Style refers to the way you layout your source code. In many languages, source code layout is simply ignored by the compiler. You can write as you like. It is very important for code readability and understanding to use the same coding style across all files of an application. It is even important to have the same coding style in all your source code. Having the same coding style helps reading the code. And if you carefully select your coding style, you can even pinpoint coding errors simply because something look strange in the layout. Of course, if you share your code among a team, like I do, it is very important that everyone in the team uses the same coding style. it is even important that in a company, all development teams use the same coding style so that code can be easily read and shared across teams and developers. What coding style to use? I would say that this is mostly a matter of personal preferences as long as the style is constant and emphasizes the code structure. I wrote my personal preferences in a document titled "ICS Coding Style". The name comes from the fact that I wrote it long time ago when a lot of peoples started to make changes to ICS. I wanted everyone to use the same coding style as me. Not an easy task because every developer think his coding style is the best. The following image gives an idea of my coding style. You can download my coding style document from here. There are many "code formatter" on the market. The IDE is use (Delphi) has a fairly powerful code formatter. But this is not enough. For example, no code formatter will be able to rename the variables, methods and other identifiers according to a naming convention. Nad properly naming identifiers is an essential part of the coding sytle. Code formatter also doesn't handle all aligments. For example, when the code must be broken into several lines, the code formatter will mostly go to the next line with some indentation. i prefer to aligne arguments and this become problematic for the code formatter when arguments are themself function calls. Paul Toth, a well known Delphi Developer rewrote his CubeMan3D with FireMonkey, making it a cross platform application. 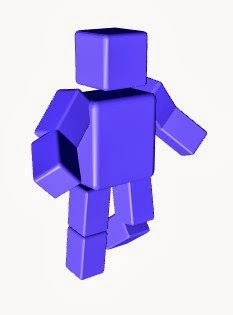 The application shows an animated man made of 3D cubes. The man walk in place and turn on himself. Actually, each cube is a standard FireMonkey TRoundCude 3D component. They are all linked together to form the body and members. The animation is made with a TFloatAnimation for each cube. It is amazing how short the code is. 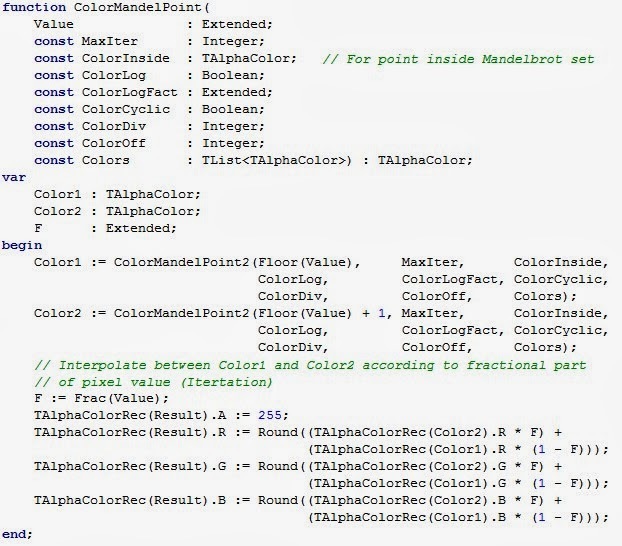 The code is just the implementation for the AnimationFinish event for the leg. The event handler simply reverse the direction and restart. The code source is available from here. Paul Toth is a freelance Certified Delphi Developer. If you need some help with Delphi, feels free to contact him. There is a new blog talking mostly about Delphi FireMonkey on the mobile platform (iOS and Android). The blog also covers other topics, mostly related to FireMonkey and the various supported platforms. This new blog is named FMXexpress. Actually, this blog is collecting blog articles from everywhere, display a short abstract and redirect to the original blog article. This is a place to visit on a regular basis. Click here to visit the blog. There is also a corresponding FaceBook page. Embarcadero published hotfix #4 for Delphi XE5 and C++ Builder XE5. This hotfix is an update for the command line tool "reFInd". If you don't know reFInd, it is a tool to help migrating code to Delphi XE5. It is a kind of search and replace on files using Perl RegEx expressions. For example, you can migrate BDE toFireDAC. Documentation on reFInd can be found here. The hotfix is availabe for download here. I made available a zip file with the full source code for my TIniFile class compatible with both Windows and Android. 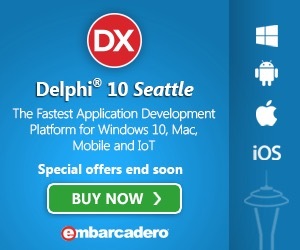 You need Delphi XE5 to compile it for Android and a reasonably recent Delphi to compile it for Windows. You can read the article on my blog. This article explain how it works. Our modern world is full of programmable and interactive devices. Delphi and C++Builder can be used to work with these devices and gadgets in innovative ways and extend your apps in ways you never may have imagined. When writing cross platform applications, you are faced with different ways of doing thing depending on the platform. Thanks to the OOP paradigm, we may encapsulate those things in a class and create an implementation specific to each platform. This class hides all the details which are not readily portable. In this article, I will model a class depending on the operation of the well-known Windows INI files. Of course, Windows own system will be used in the Windows implementation. On Android side, I will use the SharedPreferences API which is very close. In an INI file, you have Key-Value pairs organized by sections. You can read or write values. Under Windows, the INI file format is a simple text file with a Key=Value per line. All Key-Value pairs related to the same section are grouped under a header line in the form of the section name between brackets. Since the beginning, Delphi has a class encapsulation Windows INI files. It is well named “TIniFile” and sits into “System.IniFiles” unit. I will use the same class name in my implementation and even the save class signature by inheriting from the existing TCustomIniFile for Android and TIniFile for Windows. Using the same class name as an existing one will force you to pay some attention to the units used in the uses clause, and/or prefix the class name you intent to use with the unit name. I made things simples. Under both Windows and Android, in your application, you do not use System.IniFiles but FMX.Overbyte.IniFiles. No other change is required. Your application will compile targeted for Windows as well as Android. The conditional compilation is located in FMX.Overbyte.IniFiles and you can safely ignore it! TIniFile constructor takes a filename as argument. This will be the file where the sections and key-value pairs will be stored. The Windows API store the file exactly where you specify it when using a full path. When you omit the path, Windows tore the file in the Windows directory. Since Windows Vista, normal user cannot write to the Windows directory. So it fails. I slightly changed the base class so that when a full path is omitted, the INI file is stored in the user profile LoaclAppData special directory (non-roaming version). This is a convenient place most of the time. You may always specify a full path name if you want to store it elsewhere. Android has a “well known” place to store the preference files. We are not supposed to know where. The actual files are not available directly unless your Android device is rooted. TIniFile constructor in the Android implementation will simple ignore any path you specify and let Android API store the file where it want it to be stored. This could cause a problem if you want to use the same file name for different files stored in different folders. This will cause trouble since the path is ignored. The windows implementation is quite trivial since it already exists in Delphi RTL. As stated above, I derived my class from Delphi existing class and only override the constructor to adjust the path when left empty. This implementation makes use of SHgetFolderPath API function to get the special directory “LocalAppData” located in each user profile. I used ForceDirectories to create the directory if it does not already exist. You may want to change the location by changing the constant CSIDL_LOCAL_APPDATA to another one (There is a bunch of such constant, see the API documentation or Delphi source code if you have an edition which includes it). You may also want to change the string constant “CompanyFolder” to your actual company name instead of OverByte which is my company name. Using the demo application named “IniFileDemo”, running under Win7, the INI files without path will be stored in “C:\Users\\AppData\Local\OverByte\IniFileDemo”. Android implementation makes use of SharedPreferences API which is already defined by Delphi runtime library. You handle that API using an interface named “JSharedPreferences” which is located in Androidapi.JNI.GraphicsContentViewText. We need to implement most of the TIniFile methods. We can skip the read/write for other data types than string because they are all based on the read/write string. The class TIniFile derives from existing TCustomIniFile. I used the fully qualified class name to avoid confusion (Here it is not strictly necessary since we do not redefine TCustomIniFile). All the public methods are those required to make TIniFile work as it does under Windows. Private members are required as helpers for the implementation. As their visibility implies, you will never directly use them. All methods need to get hand on a JSharedPreferences interface. That is why I created a member variable FPrefs to store it and an InitPrefs method to initialize it. FPrefs.GetString is themethod use to retrieve (read) a stored value given his key. Here, as explained above, we implement the concept of section, so the key is really constructed using the section name and the identifier used outside of the class as key. JStringToString and StringToJString are support functions to marshal back and forth a Delphi string to a Java string (Remember Android API is written in Java). ReadSection, ReadSections and ReadSectionValues all require to enumerate all keys are save values in a string list for some of the keys if they match a condition. Iterating all the keys is a common process so I moved it to a specialized private method ReadSectionKeysValues. The objects are here JStrings we can convert to Delphi string and process them. The enumerated strings looks like this: “[Section1]_Key1=Value1”. We can then easily parse the string to extract the parts and do whatever we need with it. The rest of the class implementation is quite trivial. // specify that path name specifically. What programming languages have you used this year? There is a website which maintain a voting system about which language has been used in 2013. The presentation is very nice. Of course, you should vote for your favourite language (I hope it is Delphi). To vote you need a Tweeter account. Send a tweet using the hashtag #code2013 and then the language you vote for.